Today, we’re excited to announce TensorFlow Privacy (GitHub), an open source library that makes it easier not only for developers to train machine-learning models with privacy, but also for researchers to advance the state of the art in machine learning with strong privacy guarantees. Modern machine learning is increasingly applied to create amazing new technologies and user experiences, many of which involve training machines to learn responsibly from sensitive data, such as personal photos or email. Ideally, the parameters of trained machine-learning models should encode general patterns rather than facts about specific training examples. To ensure this, and to give strong privacy guarantees when the training data is sensitive, it is possible to use techniques based on the theory of differential privacy. In particular, when training on users’ data, those techniques offer strong mathematical guarantees that models do not learn or remember the details about any specific user. Especially for deep learning, the additional guarantees can usefully strengthen the protections offered by other privacy techniques, whether established ones, such as thresholding and data elision, or new ones, like TensorFlow Federated learning. For several years, Google has spearheaded both foundational research on differential privacy as well as the development of practical differential-privacy mechanisms (see for example here and here), with a recent focus on machine learning applications (see this, that, or this research paper). Last year, Google published its Responsible AI Practices, detailing our recommended practices for the responsible development of machine learning systems and products; even before this publication, we have been working hard to make it easy for external developers to apply such practices in their own products. One result of our efforts is today’s announcement of TensorFlow Privacy and the updated technical whitepaper describing its privacy mechanisms in more detail. To use TensorFlow Privacy, no expertise in privacy or its underlying mathematics should be required: those using standard TensorFlow mechanisms should not have to change their model architectures, training procedures, or processes. Instead, to train models that protect privacy for their training data, it is often sufficient for you to make some simple code changes and tune the hyperparameters relevant to privacy. As a concrete example of differentially-private training, let us consider the training of character-level, recurrent language models on text sequences. Language modeling using neural networks is an essential deep learning task, used in innumerable applications, many of which are based on training with sensitive data. We train two models — one in the standard manner and one with differential privacy — using the same model architecture, based on example code from the TensorFlow Privacy GitHub repository. All of the above sentences seem like they should be very uncommon in financial news; furthermore, they seem sensible candidates for privacy protection, e.g., since such rare, strange-looking sentences might identify or reveal information about individuals in models trained on sensitive data. The first of the three sentences is a long sequence of random words that occurs in the training data for technical reasons; the second sentence is part Polish; the third sentence — although natural-looking English — is not from the language of financial news being modeled. These examples are selected by hand, but full inspection confirms that the training-data sentences not accepted by the differentially-private model generally lie outside the normal language distribution of financial news articles. Furthermore, by evaluating test data, we can verify that such esoteric sentences are a basis for the loss in quality between the private and the non-private models (1.13 vs. 1.19 perplexity). Therefore, although the nominal perplexity loss is around 6%, the private model’s performance may hardly be reduced at all on sentences we care about. Clearly, at least in part, the two models’ differences result from the private model failing to memorize rare sequences that are abnormal to the training data. We can quantify this effect by leveraging our earlier work on measuring unintended memorization in neural networks, which intentionally inserts unique, random canary sentences into the training data and assesses the canaries’ impact on the trained model. In this case, the insertion of a single random canary sentence is sufficient for that canary to be completely memorized by the non-private model. However, the model trained with differential privacy is indistinguishable in the face of any single inserted canary; only when the same random sequence is present many, many times in the training data, will the private model learn anything about it. Notably, this is true for all types of machine-learning models (e.g., see the figure with rare examples from MNIST training data above) and remains true even when the mathematical, formal upper bound on the model’s privacy is far too large to offer any guarantees in theory. 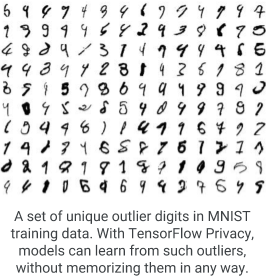 TensorFlow Privacy can prevent such memorization of rare details and, as visualized in the figure above, can guarantee that two machine-learning models will indistinguishable whether or not some examples (e.g., some user’s data) was used in their training. To get started with TensorFlow Privacy, you can check out the examples and tutorials in the GitHub repository. In particular, these include a detailed tutorial for how to perform differentially-private training of the MNIST benchmark machine-learning task with traditional TensorFlow mechanisms, as well as the newer more eager approaches of TensorFlow 2.0 and Keras. The crucial, new steps required to utilize TensorFlow Privacy is to set three new hyperparameters that control the way gradients are created, clipped, and noised. During training, differential privacy is ensured by optimizing models using a modified stochastic gradient descent that averages together multiple gradient updates induced by training-data examples, clips each gradient update to a certain maximum norm, and adds a Gaussian random noise to the final average. This style of learning places a maximum bound on the effect of each training-data example, and ensures that no single such example has any influence, by itself, due to the added noise. Setting these three hyperparameters can be an art, but the TensorFlow Privacy repository includes guidelines for how they can be selected for the concrete examples. Read further about differential privacy and its application to machine learning in this or that blog post. For practitioners, try applying TensorFlow Privacy on your own machine-learning models, and experiment with the balance between privacy and utility by tuning hyperparameters, model capacity and architectures, activation functions, etc. For researchers, try advancing the state of the art in real-world machine learning with strong privacy guarantees by improved analysis, e.g. of model parameter selection. Contribute to TensorFlow Privacy by submitting pull requests. Ask questions and share your comments or concerns by filing issues on GitHub. We’d like to thank Galen Andrew, Nicholas Carlini, Steve Chien, Brendan McMahan, Ilya Mironov, and Nicolas Papernot for their contributions to TensorFlow Privacy.